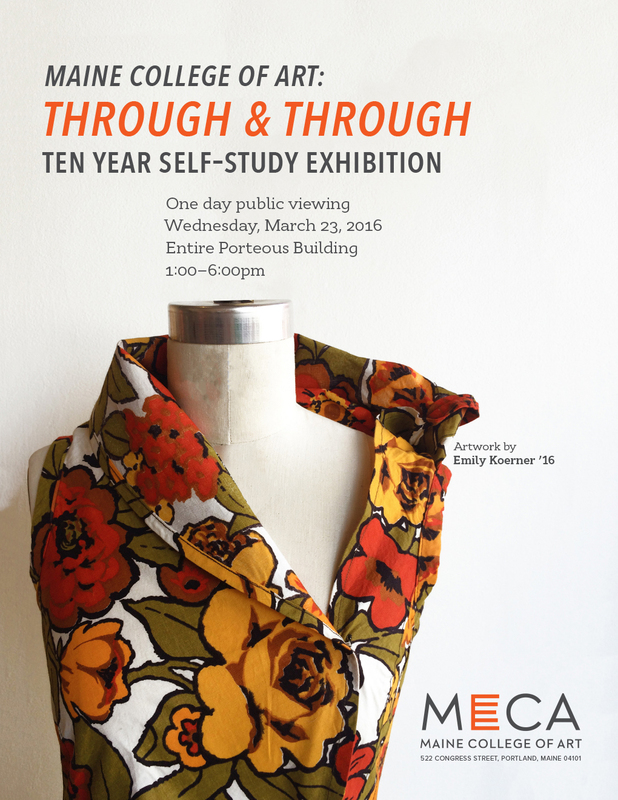 MECA: Through & Through, a special comprehensive exhibition of student work prepared for MECA’s ten-year accreditation visit, is open to the public on Wednesday, March 23rd. In preparation for MECA’s ten-year accreditation visit by a peer review team from both the New England Association of Schools and Colleges (NEASC) and the National Association of Schools of Art and Design (NASAD), the college has curated MECA: Through & Through, an exhibition that uses all six floors of the Porteous Building as well as the Institute for Contemporary Art. It is the largest and most comprehensive exhibition of student work in the college’s history. MECA: Through & Through is open one day only on Wednesday, March 23, 2016 from 1:00–6:00pm. The public is invited to view the show, which will provide examples of every aspect of the curriculum from Foundation courses to the capstone thesis requirements of each of MECA’s three degree programs: the MFA, MAT, and BFA. The BFA offers 11 majors in such areas as Textile & Fashion Design, Painting, and Digital Media. Part of the exhibit will be in the newly opened lower level of the Porteous Building, which houses the Bob Crewe Gallery and the Bob Crewe Program in Art and Music. MECA holds accreditation from both NEASC and NASAD. Founded in 1885, NEASC has been working to establish and maintain high standards for all levels of education—from pre-kindergarten to the doctoral level—longer than any other accreditation agency in the United States. NASAD, founded in 1944, is the national accrediting agency for art and design and art and design-related disciplines. Accreditation is a process by which an institution periodically evaluates its work and seeks an independent judgment by peers that it substantially achieves its educational objectives and meets the established standards of the body from which it seeks accreditation. Typically, the accreditation process includes 1) a self-evaluative description (self-study) of the institution 2) an on-site review by a team of evaluators, and 3) judgment by an accreditation decision-making body. Accreditation reviews focus on educational quality, institutional integrity, and educational improvements. Download hi-resolution poster of exhibition.